For people who love to run, but hate to get up. Yes, you read that correctly. 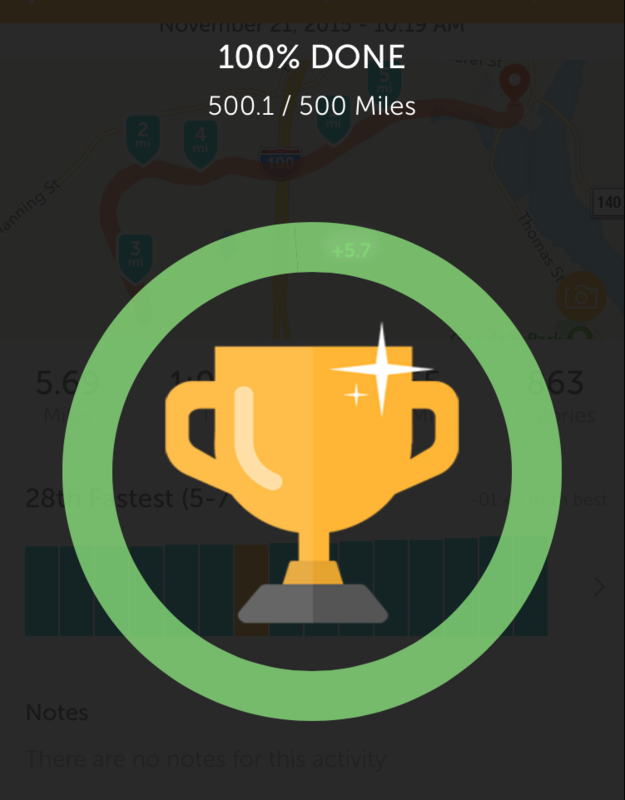 After almost 11 months of pushing myself and not giving up, I finally completed my running goal of 500 miles in 2015. It was a lot of hard work and dedication for a lazy runner like myself, but it the end, it was completely worth it! What about my next goal? I’m still thinking about it. I can tell you this, though, it isn’t going to be to run that many miles again. It’s been two months since my last check-in, but I’m happy to report that the end of my 500 mile journey is near. I’ve only added about 90 miles in the last two months, but that’s still averaging over 10 per week. I’ve had a hard go of it lately. The weather here in the Northeast is getting colder and dreary. For a few weeks it was pitch black every morning, making it hard to run. Also, trying to run after work wasn’t easy either. Now that the clocks have changed, I do have some good light in the AM, but I’ve still found it to be challenging to keep myself motivated. Well, the good news is that I’m less than 15 miles away from my goal. It seems a little surreal. Sure, 500 miles isn’t much for some, but for a now 37 year old non-runner, this will be a huge accomplishment. 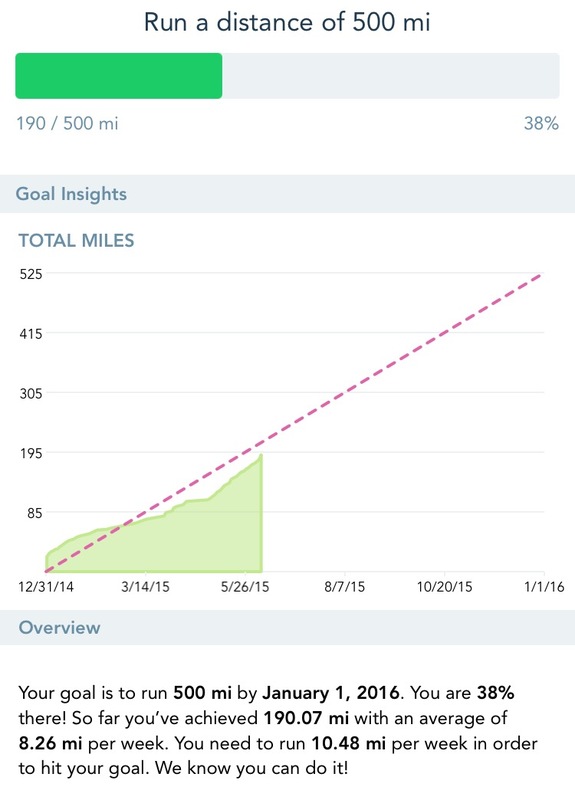 Well, I’m over 75% completed my goal to run 500 miles this year! I actually hit 75% a few days before the end of August, so technically I was an entire month ahead of schedule. Now I just need to run 30 miles a month (by the end of the year) to finish my goal. But I plan on finishing by the end of October, for reasons I’ll get into. As of today, I’m at 389.26 miles, which, when I think about it, is a lot for me (maybe most people). When I decided to set this goal, I thought, “10 miles a week, that’s nothing.” Well, I can tell you, for a busy 36 year-old, who never really ran on a regular basis, this what much more than nothing. I’ve been back from my two week vacation for over a week now, so I figured it was time to get everyone caught up. I spent two glorious weeks on the beach, and other than two days that were kind of rainy, we had nothing but sun. Before I left I was just about caught up to where my average miles per week would total more that 500 for the year. So I decided to set a mini goal to run 40 miles in the 14 days that I was away. Good news, I DID! Bad news, it killed my feet. We’re now we’ll into July and I’ve been pushing myself quite a bit. Today was the first full day of my vacation and I started out strong with a 6.3 mile run along the beach. 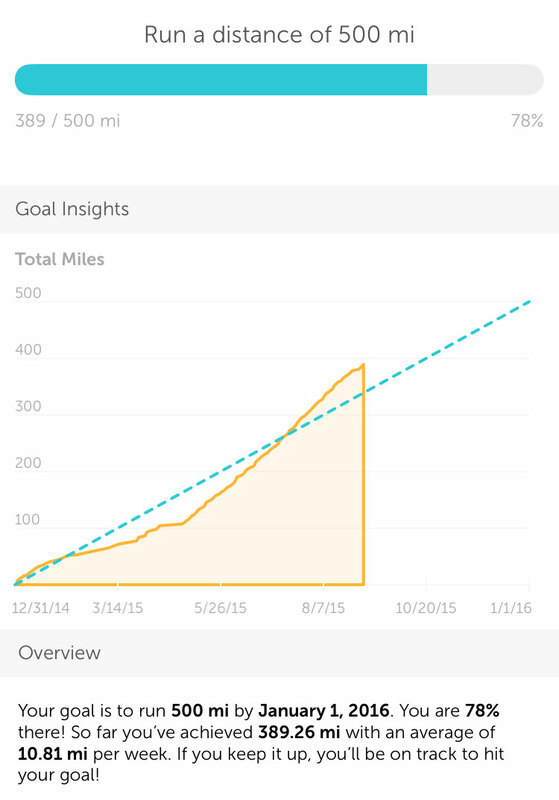 That puts me at 282 miles (56% of my 500 mile goal) and has finally put me back on track. My simple math was 500 miles / 52 weeks = ~10 miles per week. Pretty simple, right? So I figured, hey, 10 miles a week isn’t so bad. Except that I live in the Northeast, and I don’t want to run on the treadmill. I started off strong, but hit a few roadblocks in February and March when the roads were covered in ice and snow (a lot of snow). So unfortunately I started to fall behind, quickly. RunKeeper does a great job of keeping track of your progress and helping you visualize your goals. As you can see from chart below, I had a serious dip in March and into April. There is nothing more demoralizing than falling way behind on a big goal. Well, it’s been 26 weeks, 182 days, 6 months, and I’m almost half way through my goal. My goal to run 500 miles in 2015 has been a challenge, certainly filled with ups and downs, but I’m proud to say I’m just about on track. It’s been a few weeks since I’ve posted an update, but I’ve been very good. Two weeks ago I was a bit sick on that Saturday and was unable to do a planned 5 mile run, so I ended up short with just over 8 miles. However, I’ve been trying to be as aggressive as possible to make up for the few cold winter weeks that I slacked off. I’ve decided to try and do two “long” runs on the weekends of 5.3 miles each day. That way I get my baseline of 10+ miles in every week and then anything during the week is gravy. So as of now I’m 190 miles in, which is 38% of my goal. As you can see from the graph below, I’m still not on target. 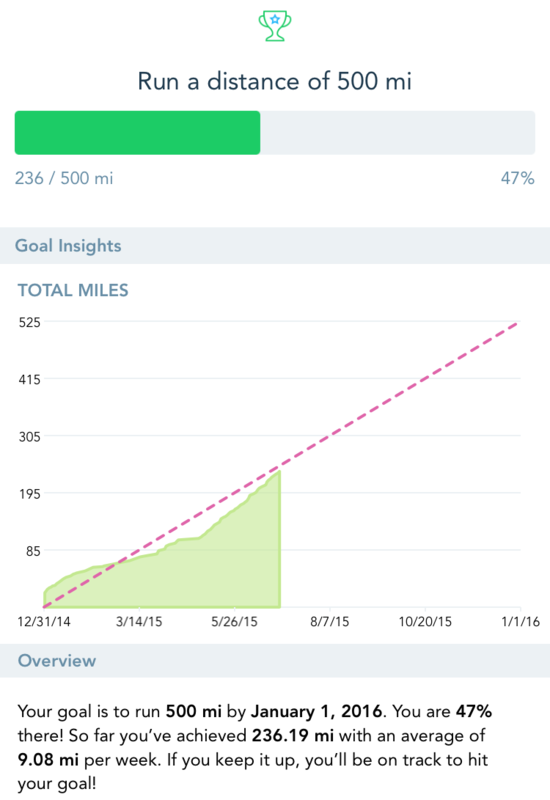 In order for me to get back on track, I need to reach 250 miles by June 30, 2015. That’s another 60 miles in 21 days. That means I’ll need to run 20 miles a week. I doubt I’ll do that, but another few good weeks and I should be able to get there. So this week has been pretty amazing so far. Out of the last 8 days I’ve managed to run 6 times. They were all just under 3 miles each, but that’s a lot better than not running at all. Unfortunately, I may have fallen victim to the too much too soon curse. The inside of my shins started to hurt yesterday, but I decided to push through today anyway and I can definitely feel it taking its toll. I’ll need to rest tomorrow so that I don’t kill the good momentum I have going with another injury. That would make for an easy excuse. It’s been a week now since I’ve been back from vacation, and I’m somewhat proud to say, that I think I’m getting back into the groove. I posted about my Wednesday run, but I also ran on Friday morning and today after doing some yard work. Getting up is getting easier with the sunny, not-so-cold mornings, and being able to run in shorts again is fabulous. Getting all the winter stuff on is such a hassle. I only ran 9 miles this week, but it’s a heck of a lot better than zero. Now I just need to keep this up so I can start getting at least 11 miles a week in so I can still meet my 500 mile goal for 2015. These may not be long runs, but 3 miles here and 3 miles there start to add up. 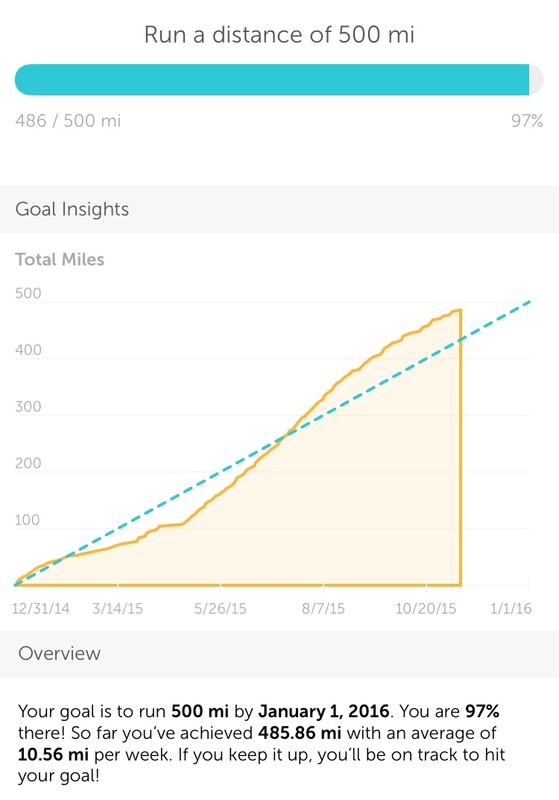 How are you doing with your running goals? Okay, so I’m going to give you a bunch of excuses. I went on vacation last week with my family. I brought all my stuff for running. I never ran. I did, however, walk a few hundred miles through the Magic Kingdom, Epcot, Hollywood Studios, and Animal Kingdom, so the week wasn’t an entire loss. But, man, it is easy not to run when you’re enjoying your vacation.